NEW YORK (AP) — The wife of Mexican drug lord Joaquin “El Chapo” Guzman played a key role in his infamous 2015 escape from prison through a tunnel dug into the shower of his cell, a witness tesified Wednesday at the kingpin’s U.S. trial. Damaso Lopez Nunez, once a loyal lieutenant for Guzman, told the jury that Emma Coronel Aispuro helped her husband communicate with his sons and others who coordinated the breakout at Altiplano prison in central Mexico. Coronel “was giving us his messages,” Lopez told a New York jury, adding that she also was in on meetings about the escape. 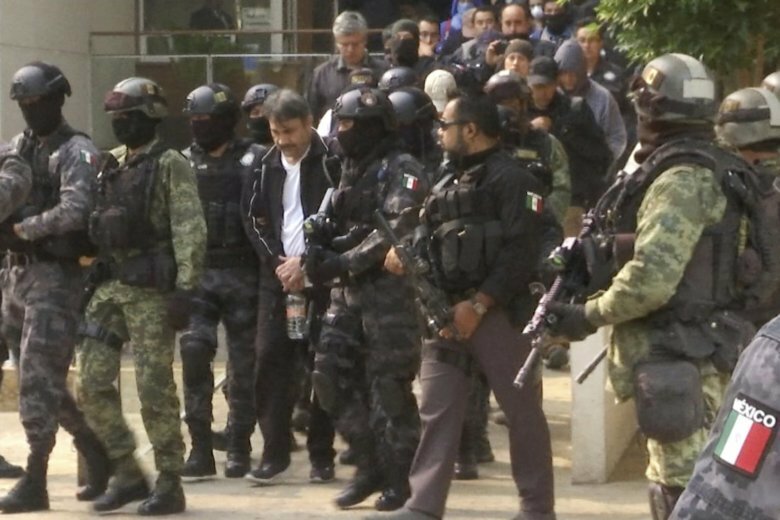 After the Sinaloa cartel boss was recaptured and thrown in another Mexican lockup, the orginization paid a $2 million bribe to a prison official in exchange for getting him moved back to Altiplano, the witness said. Before that could happen, Guzman was sent in 2017 to the U.S., where he’s been kept in solitary confinement while facing drug-trafficking charges he says have been fabricated by cooperators like Lopez. The testimony cast a harsh spotlight on a spouse who has sat quietly in the courtroom for most a trial that began in mid-November. Most of the attention on her so far has been for her wardrobe and her reaction to waves from the defendant. She didn’t speak to reporters on Wednesday and Guzman’s lawyers declined comment. As described by Lopez, the escape in 2015 was far more elaborate than one Guzman pulled off in 2001 by hiding in a prison laundry cart. It included smuggling a phone with GPS to Guzman so the plotters could determine where best to tunnel in, he said. His followers also bought property near the facility as the starting point the mile-long (1.6-kilometer-long) escape route, Lopez said. Work went on for months and was so loud it could be heard behind bars – to the point where inmates were complaining about it, he said. On the day of the breakout, a motorcycle was used to race Gurman to the exit of the tunnel, where an ATV took him to a warehouse, the witness said. He later was flown to his mountaintop hideaway. In further questioning, Lopez also touched on the 2017 slaying of journalist Javier Valdez outside his office in outside his office in Culiacan, Sinaloa’s capital city. He claimed that Guzman’s sons – not their father – ordered him shot down because he ignored their threats related to his reporting on drug-trafficking. The government’s case at the trial in federal court in Brooklyn is expected to conclude this week. The defense has included Guzman on a list of potential witnesses its case, but lawyers have been mum about whether he would chance actually testifying.